The Apache Tomcat server and related technologies give Java developers a rich set of tools to quickly build more sophisticated Web applications. Tomcat version 5 supports the latest JSP and Servlet specifications, JSP 2.0, and Servlets 2.4. 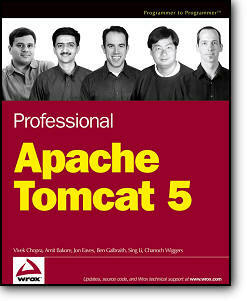 This completely updated volume offers you a thorough education in Tomcat 5 as well as 4.1. You will learn to solve the problems that arise with installation and configuration, security, system testing, and more. This edition also introduces you to Tomcat clustering for planning and deploying installations in mission-critical production environments, and explores the new support for Tomcat in popular IDEs, such as IntelliJ IDEA, Eclipse, NetBeans/Sun Java Studio, and JBuilder. You’ll discover how to manage class loaders and Connectors, understand how to use IIS as a Web server front-end for Tomcat, examine JDBC-related issues in Tomcat, and be ready to put this technology to work.